Create a Beautiful Life: What's red, white and cuddly? My sweet little Santa baby of course. I love the texture in this layout in person. I started with a Crate paper background sheet that I sprinkled with Glimmer Mist in Antique Brass for a little shimmer. The next layer I used was (believe it or not) a tissue. Yes a tissue. On our trip to Pokolbin and Cessnock before Christmas my mum, sister and I stumbled across a gorgeous little paper shop (the name escapes me at the moment). They had for sale little packs of tissues printed with the sweetest patterns. Of course I saw more than nose-blowing potential in these tissues and had to have the pack printed with music notes. They also had gorgeous notebooks, washi tape and some items from the K & Co Smash line. I could have browsed that little shop for hours but of course the children were less than keen for that idea. 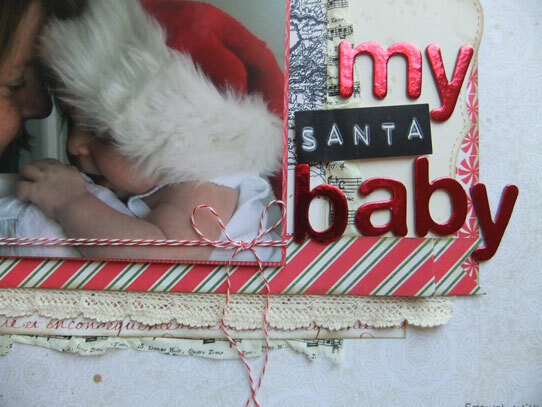 But back to my layout, I layered various patterns from my Counterfeit Kit mainly using a cream and red theme. The "Santa" sticker came from an old sheet of Pebbles Inc label stickers. Layers, layers, lots of lovely layers. The only other non kit item on the layout is a scrap of scalloped lace. I wish I knew where I got that one from - it is sooo pretty. 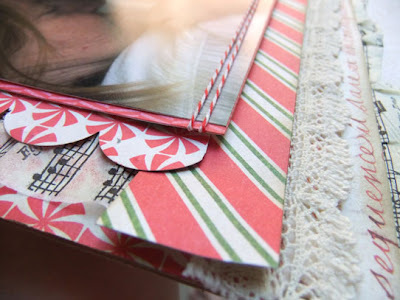 Stunning in every way - a cute photo, luscious layering and a brilliant title. Wonderful page! I love all the textures and layouts you used on this layout. I agree - absolutely stunning! How gorgeous! Like the way you used the tissue.I've noticed pretty ones in LIncraft and had the same thoughts. How adorable is that? Love the title and the layers. Beautiful! Precious layout!! Love all the layers!! What a sweet photo! Your loayout is so beautiful. I love the tissue paper and all the layers (I'm a great layers fan...). Oh my, what a cute picture! Great page!